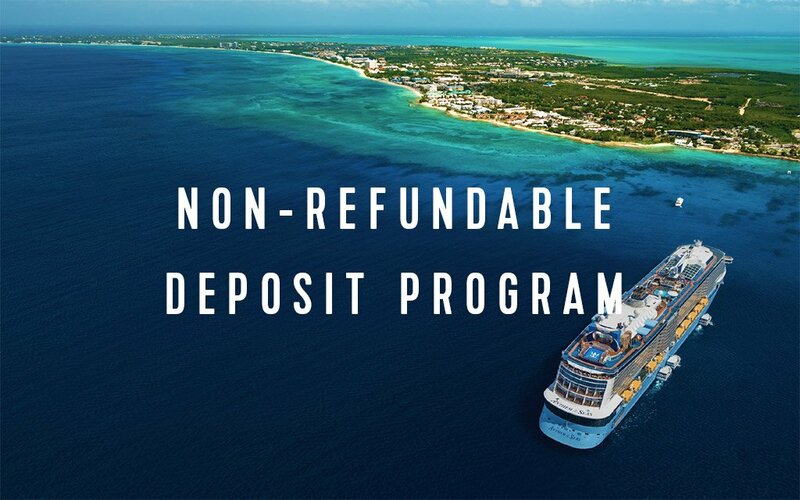 Royal Caribbean announced today a new non-refundable deposit program, which is an addition to the traditional refundable deposit model. Royal Caribbean also announced a a non-refundable deposit will become the only option for those guests interested in reserving an upper Suite (specifically Grand Suite or higher). This also holds true for guarantee categories, including W/WS, X/XB, XN, Y/YO, and Z/Z. In an effort to deter continual or late ship/sail date adjustments, a change fee of $100 per guest will be imposed to all reservations booked under a nonrefundable deposit fare that opts to change either the ship and/or sail date originally selected. Such fees will be incurred, without exception, at time of change, thus, emphasizing the importance of ensuring that your clients are aware of the detailed terms of this program at time of booking. Multiple adjustments to the ship and/or sail date of a booking will result in the assessment of a $100 per guest change fee for each qualifying change made to the reservation. There is no limit on the number of change fees that can be incurred. Change fees are only incurred should an adjustment to the ship and/or sail date occur; therefore, no change fee will be assessed upon swapping between category types on the same ship and sail date. If guests opt to cancel a cruise reserved under the nonrefundable deposit fare, that is outside of final payment, guests will receive a Future Cruise Certificate in the amount of their designated cruise deposit, less the $100 per guest change fee. Such Future Cruise Certificates can be applied towards a future Royal Caribbean cruise vacation when reserved within 1 year of the issue date. Thereafter, the Future Cruise Certificate will expire and becomes invalid. What do you think of this new non-refundable deposit program? Will you take advantage of it? Let us know in the comments!